Report by Anthony Southwell and Mike Lancaster. Photos by Keith Plamping. 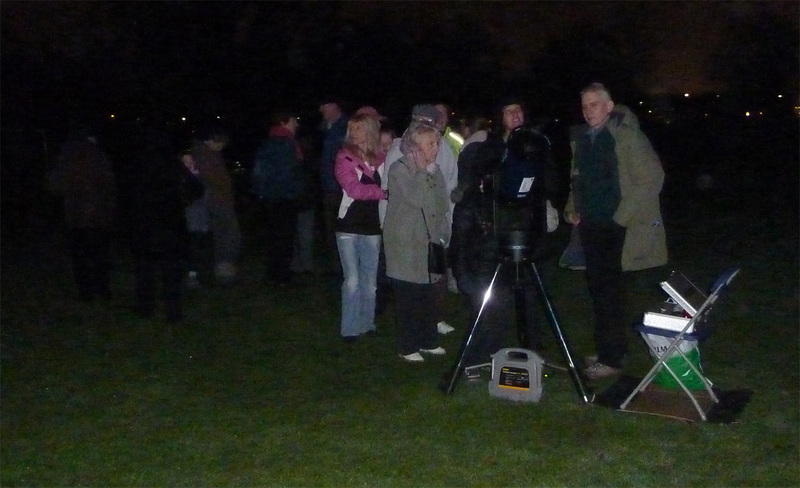 The DDAS was invited to participate in the Stargazing Live event held at Alvaston Park in Derby on the evening of Wednesday 18th January 2012. This event was a huge success despite the cloudy skies. It was organised by the Alvaston Park Friends and during the morning of the 18th January they opened a Science Garden. This is literally a short walk in the park where you can go from the Sun to Mars on a specially laid out path, with a globe located at each planet's position. During the evening we had two telescopes on-site on the cricket pitch next to the new pavilion building and a number of members were in attendance. These were the Society's 8" Meade LX-90 operated by Mike Lancaster, and the ETX90 telescope recently donated by DDAS member Jackie Wardill, operated by Dave Selfe. The Society display boards were in a prime position, located inside the foyer of the pavilion building and Anthony Southwell manned another Society display comprising a PowerPoint presentation concerning the DDAS and various planetary and deep sky images taken by DDAS members. Also present was the Skybolt Rocket, built by Starchaser Industries. They gave an audio-visual presentation concerning their activities, which was given by Starchaser CEO Mr Steve Bennett, to whom Anthony spoke with later on. There were also the Mad Science people teaching the children how to make a strange green goo which apparently glowed in the dark! 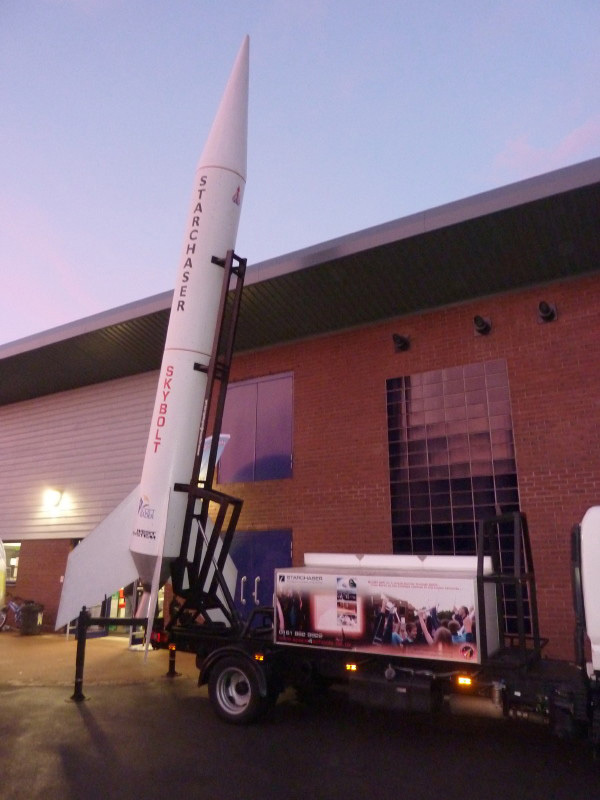 There were 'Make your own Rocket' as well as 'Draw an Alien' activities for the children, and the local model aircraft society also had a presence. Meanwhile Derby Museum and Art Gallery projected images of a selected number of plates from John Flamsteed's Atlas Coelestis, which is currently on display at the museum. We were informed by the Alvaston Park Friends that they had at least 1000 people visit during the evening! Anthony alone must have talked to upwards of about 300 people, as well as giving out Society information handouts. Our telescopes were very busy too, and at one point in the evening there was a line of people at each telescope 100 strong! Jupiter stole the show and Mike kept the LX90 trained on it the whole time while Dave also gave the Orion Nebula a go. Mike states "I will not forget the sight of a long queue of people snaking its way back to the pavilion like some nocturnal conga, and they were all so interested even during the times when Jupiter almost faded out completely behind the clouds! When it cleared enough we got plenty of wows, oh my gods, and cools." Our thanks also to DDAS members Keith Plamping, John Holmes, Robert Seymour, Claire Spencer and Barry Ashforth for swelling our ranks on the evening. Mike Lancaster introduces the assembled crowds to the delights of Jupiter and its moons through the Society's LX90 telescope. The Skybolt rocket from Starchaser Industries.